Chopped salad with roasted chickpeas – A colorful, hearty, vegetarian chopped salad with roasted chickpeas and kale tossed with a garlicky buttermilk dressing. Vibrant, healthy and filling. I was going to call this chopped salad with roasted chickpeas a rainbow chopped salad because it is so colorful. This vibrant, filling salad is packed with fresh vegetables and crunchy roasted chickpeas. You start with baby kale tossed in a garlicky, tangy buttermilk dressing. Next, top the kale with nutty roasted chickpeas, crunchy bell pepper, cucumbers, sweet cherry tomatoes, salty feta and olives. When it’s all tossed together it makes a bright, healthy, hearty salad. The classic buttermilk dressing for this salad really won me over – it’s light and garlicky and tangy. I don’t make buttermilk dressings very often because they are usually too thick but this dressing is not heavy or thick – it’s a light, garlicky dressing that easily coats all the kale and vegetables. The chickpeas are roasted with a little bit of garlic, olive oil, salt and pepper. After roasting, they become crunchy and nutty. 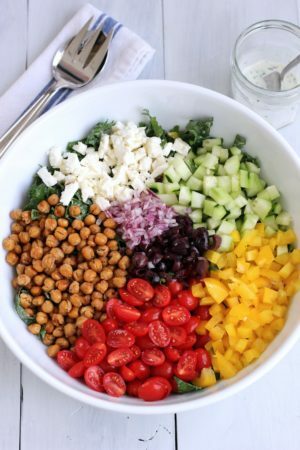 Chickpeas are loaded with protein and fiber so they make a great, healthy addition to this salad. After rinsing and straining the chickpeas, make sure to dry the chickpeas with paper towel – blot off as much water as you can. This will help with the crispy factor when you roast them. I used baby kale in this salad. I find it easier to eat than regular kale – it’s not as tough or chewy as regular kale. After you’ve made the dressing, toss half of it over the baby kale and let it marinate the kale while the chickpeas are roasting in the oven. This will help soften the kale up a bit. This salad holds up well in the fridge – so make some extra for lunch the next day. And if you want to change things up at bit, try adding it to a tortilla as a wrap for lunch. The buttermilk dressing adapted from this recipe. A colorful, hearty, vegetarian chopped salad with roasted chickpeas and kale tossed with a garlicky buttermilk dressing. Vibrant, healthy and filling. Rinse canned chickpeas and dry with paper towel. Toss chickpeas with 1 tbs olive oil, 2 cloves of minced garlic, 8 twists of pepper and a pinch of salt. Spread chickpeas out onto a roasting pan and roast in the oven for 30 to 40 minutes. After 20 minutes, stir the chickpeas so they don’t burn. Remove when they are toasted and golden brown. Let cool. While chickpeas are cooking, make the dressing. Smash 1 clove of garlic to a paste. 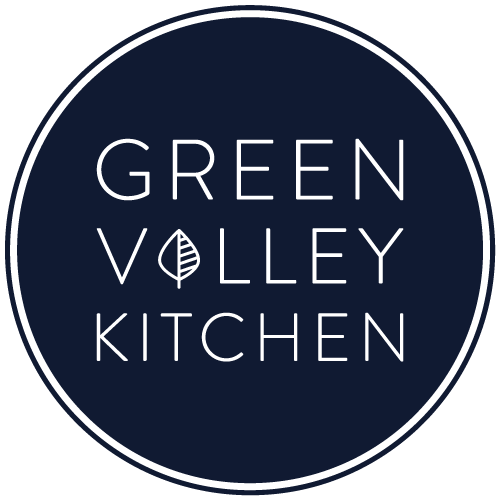 Add smashed garlic, chives, parsley, buttermilk, mayo, white wine vinegar, black pepper and salt to a small bowl and whisk to combine. Roughly chop baby kale and toss with half the buttermilk dressing – let marinate while you’re prepping the rest of the salad. Chop cherry tomatoes, cucumbers, yellow pepper, feta, olives and red onion. Add chopped vegetables and roasted chickpeas to the salad and toss with remaining buttermilk dressing. This looks like such a healthy and refreshing salad! I love the addition of roasted chickpeas, which must add so much flavor. And I’m really liking the look of your buttermilk dressing! I usually don’t love creamy dressings either, but kale is so sturdy that I think a dressing like this is the perfect complement. Thank you for sharing, Geraldine! Hi Julia – I’m with you on the creamy dressings – they’ve usually too thick and goopy – but this one was really good – not too thick, covered all the veggies easily and packed with garlicy flavor – it really made this salad. Hi Medha – I agree, chopped salads are so easy, fun and versatile – you can pretty much throw in whatever is in the fridge! Thanks, Izzy – the buttermilk dressing really makes this salad! This salad is absolutely beautiful! Those colours are just super naturally eye-catching! Love chickpeas – that addition is lovely! Need to give this recipe a go soon! Hi Jess – thanks so much – I’m a big fan of colorful food :). This looks like a wonderful salad, Geraldine! I love that you added roasted chickpeas…kind of like croutons 🙂 Looks so fresh and delicious! Hi Denise – I hadn’t thought of it like that, but the chickpeas are like mini croutons! Definitely ups the crunch factor by roasting them. 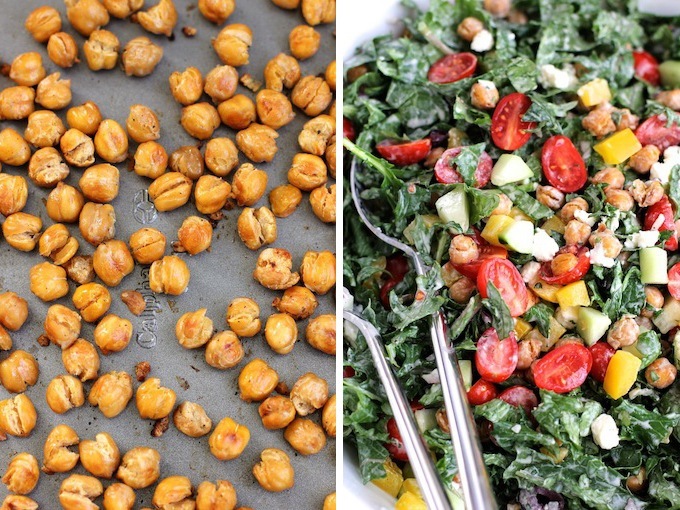 I love the looks of those crunchy roasted chickpeas in there, what a great addition to salads. I’m going to roast up a batch this weekend and get a chopped salad going for lunches next week. Thanks for the inspiration! Hi Katie – This is a good salad for lunches since it holds up well in the fridge overnight. I think it would work really well in a wrap or pita as well. Have a good one. Thanks so much, Traci! I love baby kale – it definitely easier to eat than regular kale. The buttermilk dressing is now my new favorite dressing. And yes, yay to spring! Your dressing sounds so good. Such a nice complement to the nutty tasting chickpeas and earthy baby kale. Beautiful salad, Geraldine! Pinned! Hi Annie – the buttermilk dressing really worked out great with this salad. Hope you give it a try! Have a good one. I’ve become a huge fan of chopped salads. I love what you’ve done with the chick peas. We love adding them to salads, but never thought about roasting them. What a great idea! 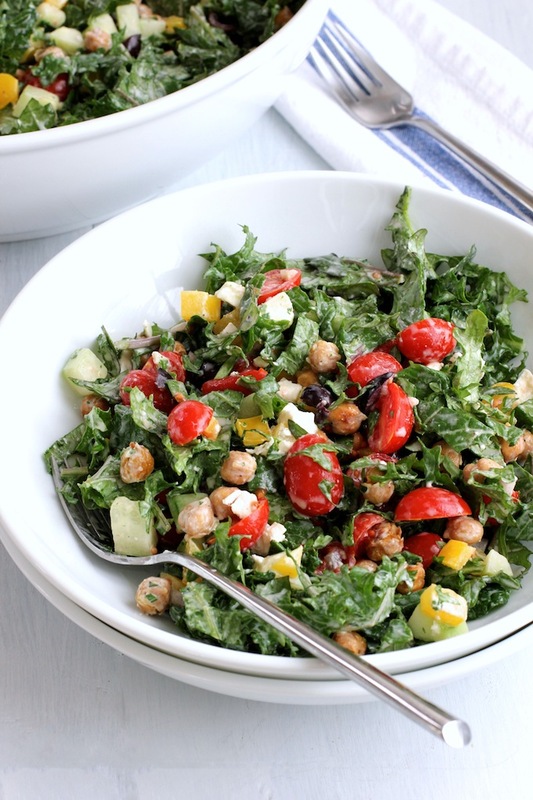 Hi Kathy – the roasted chickpeas definitely makes this a hearty salad. They also change the taste of the chickpeas – giving them a crunchy, nutty flavor. Hope you try it!